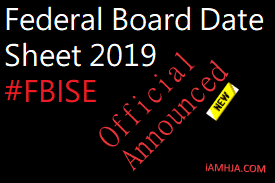 FBISe Date Sheet 2019 for 9th and 10th class is announced by federal board official. if you are looking and searching for federal board date sheet for SSC and HSSC. now the examination is started from March 2019. now prepare for the examination now examination started soon.